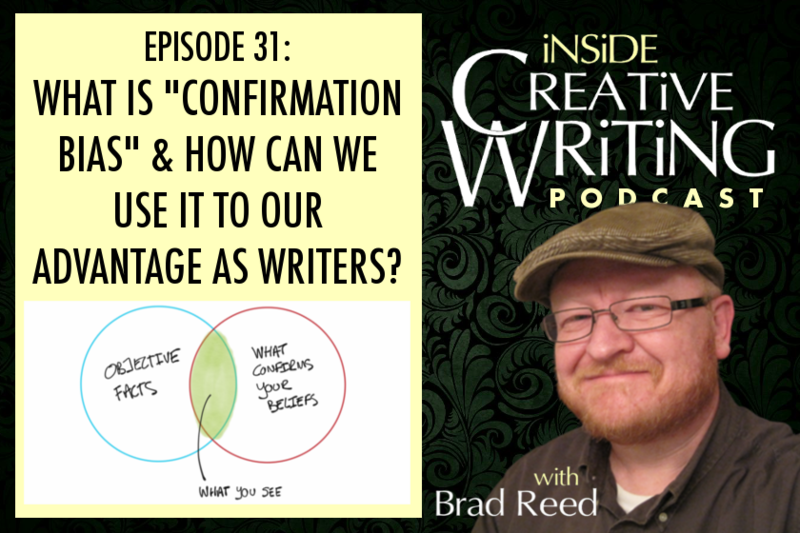 Episode 31: Today we’re exploring a concept called “confirmation bias” and how we can use it to influence readers, agents, and publishers and how it can also help bring our characters to life! We see it all the time in our real lives, especially in an area like politics. If you’re biased one way or another, you’re more likely to seek out and watch channels that support your position, or confirm your bias, than you are to watch channels that provide evidence against it. And, even if you do hear alternative positions, you’re more likely to ignore or discount the ones that don’t fit your position than you are the ones that build it up. I tell my academic writing students that teachers and professors do the same thing. That’s why proper format and titles and double-spacing and font choice and all of those things matter. If a professor looks at an essay and the formatting is all wrong or they’ve clearly used too large of a font in order to meet a page count or something like that, then the professor can’t help but form an initial opinion, an initial expectation, or an initial bias. Whether intentional or not, and it’s usually NOT intentional, the professor will see everything else as a way to confirm that initial bias. If the formatting is good and everything looks like it should, and the professor discovers a misspelled word, it’s easy to think, “oh well, everybody misses a word here and there. It’s clear this writer knows what she’s doing, though” and they can look past it. If the formatting is off and the same misspelling happened, the professor will instead think “See, I knew it. I knew this writer wasn’t good. And there’s even more proof.” It may not be fair, but that’s the real world. That’s just the way our brains work, the way they process the world around us that throws WAY more information at us than we can possibly process. It’s a shortcut that we use to navigate the world. Sometimes it’s dead on right, and other times it misfires. What’s important as writers is that we recognize that this is what is happening when people encounter our work. Like it or not, potential readers, agents, and publishers are all doing the same thing with our work. They are getting a first impression based on things that may have absolutely nothing to do with how well you write that are going to color the rest of the experience of reading your book or manuscript. So today we’re going to look at some of the ways that we can get confirmation bias on our side. How can we make sure that our readers – whether it’s someone looking to purchase our book on Amazon, an agent considering representing you, or a publisher considering putting your book out there into the world – how can we get them on our sides before they’ve even gotten more than a few pages into our manuscripts, if even that far. Although I’d like to say this has largely gone away, I’m not sure I can say that… something to keep in mind. Make sure it reflects your genre, your market. Playful, fun, and spontaneous might work, but professional is probably better. Whatever you do, do it intentionally and get feedback! I had to email somebody the other day who was still using an @yahoo email address. Now, I’m sure there are some of you listening right now that still use one as well… actually, I’m not sure of that at all! Did you ever stop to think about what your email address says about you as a person? I’m not even talking (yet) about what your address before the @ sign is, I’m only talking about what’s after the @ sign. Sure, everybody uses gmail addresses now, so what’s the big deal. Well, that IS the big deal. Everybody uses them. They’re free. They’re ubiquitous. They probably don’t HURT your image as a professional writer, but they don’t actively HELP it, either. Consider purchasing a domain name to show your potential agents and publishers that you’re serious about what you’re doing. For example, my email is bradreed@bradreedwrites.com. There is hopefully no question in people’s minds that I’m serious about writing, based on something as simple as an email address. And please, make sure you’re not using the same email address you set up in middle school. The email smashmouthrocks@msn.com is not going to impress anyone. Same thing goes for Twitter handles and other social media profiles. These are branding opportunities and actually carry a lot of power. They are like billboards for your writing business–what is the most important information you can convey in just a few words? Probably your actual, human name–or your pen name if you’re using one. And maybe one other detail–maybe. All of my social media echoes my website and email address: bradreedwrites. If they are important within each sentence of your book, how much more important to get rid of them in the title! Lose every word that doesn’t have to be there. Get rid of adverbs. Choose specific language. Try to find that title that no other book could have. You wouldn’t tell a great cover artist that they should write their own book, would you? There are subtle, fine details of craft that, just like writing, we can sense and recognize on a deeper level. People can’t help but judge a book—and its author—by the cover. The only reason there is a famous saying “You can’t judge a book by its cover” means that that’s exactly what we’re wired to do. We can’t help it. It’s how our brains operate, even if we’d prefer they didn’t. This is terrible to admit, but there are self-published books out there that I’ve really enjoyed, but that I don’t recommend to other readers because of how terrible the cover looks. The cover reflects on the quality. If we’re using the analogy of the job interview here, then everything up to this point has been the first impression that you and your book make before you ever speak a word. These are like the clothes you wear and the posture you use and the expression on your face. Now it’s time to actually open your mouth and speak. How important are the first words you say? Well, they’re absolutely vital, of course. These first words are your opening sentence, maybe the first paragraph. If that goes well, then maybe the entire first chapter. Remember that 7-second rule. A reader, an agent, a publisher is beginning your book with the exact same question in mind: Is this book any good? They begin making that decision on the first page. Of course their looking for grammatical problems–a page littered with adverbs or evidence that you don’t have control of your conventions can be an immediate turn-off. But they also want to see that you know how to hook your reader into a story. And I’m not necessarily talking about throwing a gripping action scene on the first page of your story—not all stories work that way. Some start very quietly, but any well-written book will lead the reader into a world or a character that a reader can’t help but be curious about. It creates “little mysteries” that make the reader want to turn the page to find out the answers. In a way, that’s the heart of all writing. Leaving enough little mysteries–and sometimes HUGE mysteries–that the reader is just curious enough to turn to the next page. Do that consistently over a few hundred pages and you have a solid novel or screenplay. Revise, revise, and revise, your opening pages. Make them shine with polish and intention. Force your reader to turn to the next page. We’ll talk about the best way to learn how to do this in our weekly challenge at the end of today’s podcast, so make sure to keep listening until then. So that’s what confirmation bias looks like for writers. You may not like that that’s the way you’re being judged, but there’s no getting around it. It’s just the way the human brain has evolved to operate. We have to make rushed decisions about whether the things around us are good or bad. And, once we’ve made those decisions, we then interpret all other evidence in light of those initial decisions. Now, I’m not saying that an initial impression can’t be overcome. I’ve certainly read student essays that have butchered the formatting that went on to be pretty solid papers, but why not do the simple things up front so that your reader is on your side from the beginning? “One is disappointed with a line, then struggles to read the page, then discounts the author. Well, why not? It is a frustrating process!” Be the writer that readers fall in love with by getting their confirmation bias on your side from the very beginning! Our weekly challenge this week involves you surrounding yourself with a bunch of books you love. Even books that you just kind of like will work, too. This can be online or with physical books. Doesn’t matter. Then I want you to do a couple of things to explore how these writers and publishers have gone about influencing your confirmation bias. First, read the titles and see what they might have in common. Do you see many words from the Kill List in the titles? Probably not. Are the titles long or short? Are they specific enough that these books are the ONLY books that could have those titles? How would your book look among these other books? Would the title stand up next to them, because that’s where it’ll be in the bookstore or on the Amazon page. The second step, and I think the most insightful, is to open each book and read at least the first sentence. What has the writer done to create “little mysteries” for the reader, even in just the first sentence? Do this with all of the books you’ve collected. What do you start to notice about these opening lines? Are they short? Long? Do they introduce a character? A unique world? A moment of tension or conflict? Do you find something in common among all these first sentences? Now read the first sentence of your work-in-progress. Does it stand up? Does it create a compelling reason for the reader to move on to the next sentence? The next paragraph? The next page? I really hope you’ll do this little assignment. I think you’ll be surprised at how much you learn and how much it changes your perspective on your own work. It’ll help you see it in a new way, like your readers will see your work and how it will influence their confirmation bias. That’s going to wrap it up for this week. If you’re enjoying the podcast, I’d love it if you’d Tweet about it or mention it to some of your writer friends and maybe even leave us a review on iTunes or whatever app you use to listen. Also, please consider joining the Patreon team. For just a couple of bucks a month, you’ll be helping to support this podcast and the other resources we are producing. Sure, it helps us pay the bills around here, but it’s also a huge emotional boost for us to know that you’re finding value in what we’re doing and would like us to continue.